Greeneview quarterback Nick Clevenger carries the ball for a gain during first-half action Sept. 14 against Mechanicsburg, at Don Nock Field in Jamestown. Greeneview’s Taylor Stinson (11) goes up for a pass, in the first half of Friday’s Sept. 14 high school football game at Don Nock Field in Jamestown. 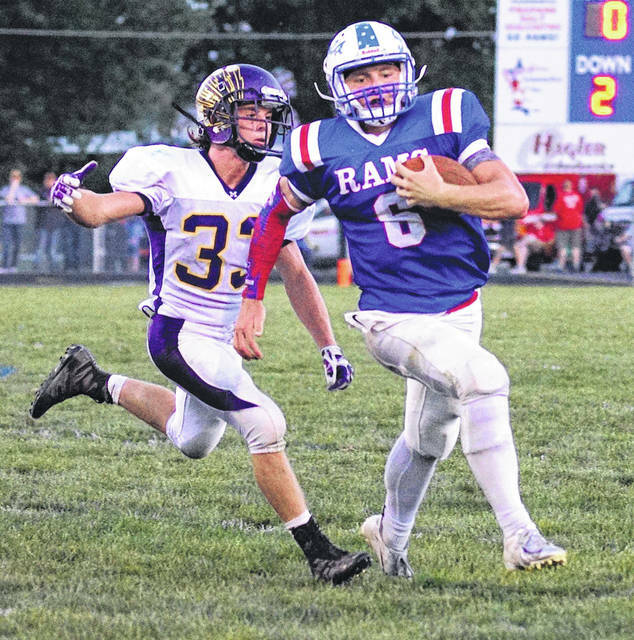 JAMESTOWN — In a game with playoff intensity — and implications — visiting Mechanicsburg delivered a 7-0 punch in the gut to the Greeneview Rams, Sept. 14. After being stuffed in the first half, the Indians (4-0) discovered their clock-chewing offense in the second half scoring on a 10-play, 65-yard drive that used up five minutes of third-quarter time. Joey Mascadri did most of the damage, along with a personal foul against the Rams (3-1), and then quarterback Logan Hurst finished the drive with a one-yard run. 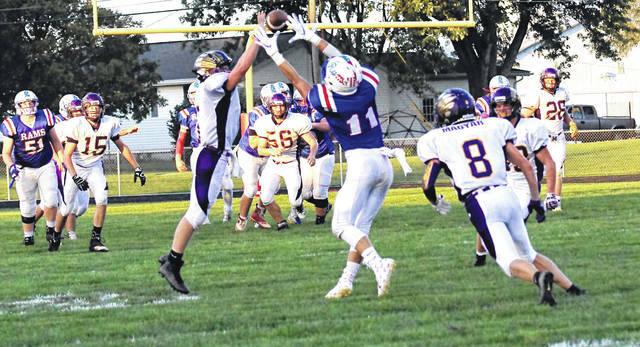 That was all Mechanicsburg needed as the Rams offense could not overcome dropped passes — a handful of drives stalled due to drops by wide-open receivers — and a pair of missed field goals in the Ohio Heritage Conference crossover game. Quarterback Nick Clevenger led the Rams in rushing with 99 unofficial yards. Taylor Stinson added 54, and Clay Payton 22. After running for 20 first-half yards, Mascadri flexed his muscles and ran for 92 in the second half, spinning and fighting for every yard. The Indians switched to a tight end wing formation in the second half and used that to their advantage. The win gives the Indians valuable computer playoff points, while the Rams could be fighting for their playoff lives even though it’s only week four. Neither team did much in the first half. Mechanicsburg never got across midfield, while the Rams entered Indian territory three times, missing a 41-yard field goal on their only legit scoring chance. They also missed a field goal in the second half when the score was still 0-0. Greeneview visits Northwestern, while Mechanicsburg hosts Madison Plains, for their next games Friday, Sept. 21.